Musekiwa Chingodza was born into a family of great mbira players in Mwangara village, Murehwa, Zimbabwe, in 1970. He began playing mbira at the age of five and is self-taught. Through listening to other gwenyambira, or great mbira players, he developed a strong attachment to and love for mbira music. He says, “Our music is both medicine and food, as mbira has the power to heal and to provide for people. Mbira pleases both the living and the dead.” In 1991 Musekiwa was a key member of the band Panjea and composed the hit song “Ganda” on Panjea’s Zimbabwean album. For many years Musekiwa taught traditional music at Prince Edward School in Harare. 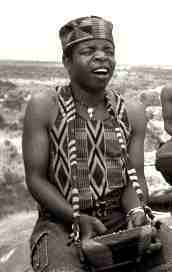 He is an excellent singer, dancer and drummer and plays both mbira dzavadzimu and nyunga nyunga. Following up on his widely acclaimed CD with Jennifer Kyker, entitled “Tsunga,” Musekiwa released his CD “VaChingodza Budai Pachena.” His newest CD, “Kutema Musasa,” was released in late 2005. Musekiwa is also an accomplished ngoma (drum) player in the Shona tradition, and he excels in playing hosho (gourd shakers), singing, and traditional dance. Musekiwa now visits the US regularly, teaching and performing, with visits sponsored by Kutsinhira Cultural Arts Center in Eugene, Oregon . He will be in the US for six months beginning in the spring of 2010.